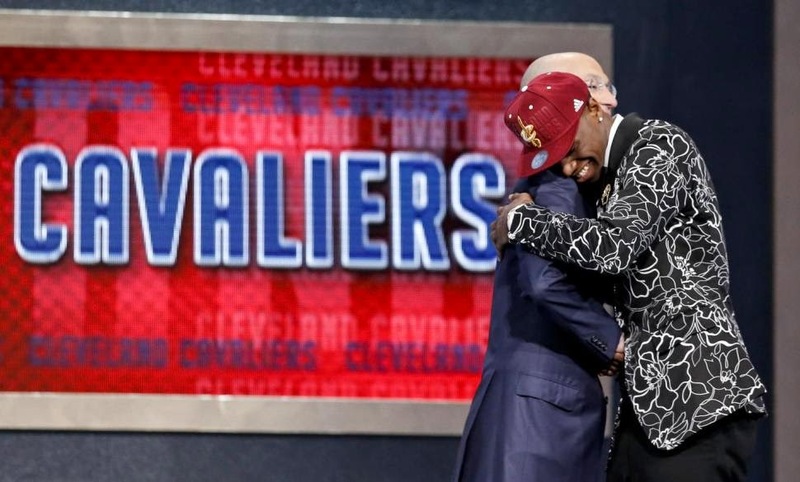 Wearing an outfit that required courage, Andrew Wiggins earned the title that was predicted since high school: No. 1 overall NBA draft pick. The Cavaliers made Wiggins the top overall pick Thursday, choosing the raw and physically gifted forward over Jabari Parker, the Duke forward who went second to the Bucks. Wiggins, the son of former NBA player Mitchell Wiggins, shook hands with new NBA commissioner Adam Silver, who emceed the opening round for the first time, and stepped off the stage with his black-and-white floral suit jacket. “I'm hoping to come in and make an impact off the bat," he said. In some ways, Wiggins was the favorite to be the No. 1 choice for years, ever since he was recognized as a basketball phenomenon at 15. The Canadian, who was dubbed a “once-in-a-generation talent” by Sports Illustrated, didn’t quite live up to the hype in his lone season at Kansas while averaging 17.1 points and six rebounds on 45 percent shooting. But his physical gifts – including a 44-inch vertical jump – were too much for the Cavs to pass up. Parker had been angling to go to the Bucks, who had the league’s worst record last season, and got his wish to play near his hometown of Chicago. “I get to represent both Chicago and Milwaukee,” he said. Kansas center Joel Embiid, once projected as the top pick in the draft and Cleveland’s target, fell to the Sixers at third overall because of injury concerns. The 20-year-old underwent surgery on his right foot just a week ago after a fracture was discovered during his pre-draft workouts. “Unfortunately, this foot injury happened before the draft,” Embiid said. For the second year in a row, the Cavs took the Best Canadian Available, except this one might be an actual superstar. Parker sent strong signals to the Cavs not to pick him, allowing the Bucks to post their biggest ‘W’ of the season. One of the few things the Sixers do well is stockpile rookie centers who can’t play due to injuries. Your classic reach. Shawn Marion clone was projected to last until 8-10 range. Exum says he’s got a little Russell Westbrook, a little Manu Ginobili and a little Tony Parker in his game. Jazz can only hope. Start the speculation about where Rajon Rondo is headed, as C’s take a competitor and defender to be Rondo’s successor. Kobe Bryant has to like Randle’s talent, but he’s really more excited about bringing Carmelo Anthony to L.A. in free agency. The way Stauskas can shoot, we’re thinking that Kings executive Chris Mullin must have given this pick his blessing.